Reinforcement in concrete will not corrode if the protective film formed in the presence of highly alkaline pore fluid with a pH of about 13 is maintained. The passive layer may, however, be destroyed by the ingress of chloride ions or by a reduction in pH due to carbonation. When the passive film is destroyed, corrosion may occur in the presence of moisture and oxygen. During the corrosion process, anodic and cathodic areas are formed on the reinforcement. At the anodes, iron dissolves and iron ions diffuse into the concrete, leaving behind electrons. 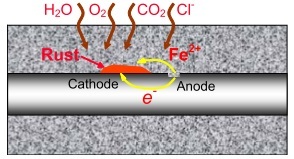 At the cathodic sites, the iron ions combine with water and oxygen to form an expansive corrosion product, i.e., rust. The rate of corrosion is controlled by how easily the iron ions can move through the concrete from the anodes to the cathodes and it depends on the availability of oxygen and moisture at the cathodes. 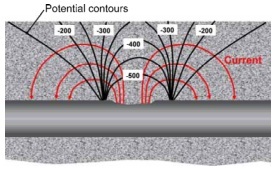 The flow of irons ions through the concrete is associated with a potential field as shown on the right. 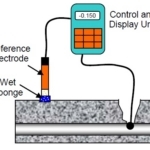 The Mini Great Dane measures the surface potentials (relative to an Ag/AgCl reference electrode) and the electrical resistance of the cover concrete between the electrode and the reinforcement. The indicated potential, Ecorr, is in terms of a Cu/CuSO4 electrode (CSE), which are -110 mV lower in value than for the Ag/AgCl electrode. 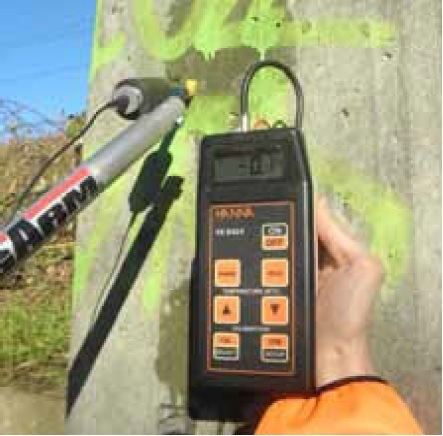 The risk of corrosion is evaluated by means of the steepness of the potential gradients measured at the concrete surface and the level of the electrical resistance of the cover concrete. A large potential gradient and a low concrete resistance will normally indicate a high corrosion rate, except in saturated concrete because of the low oxygen content. 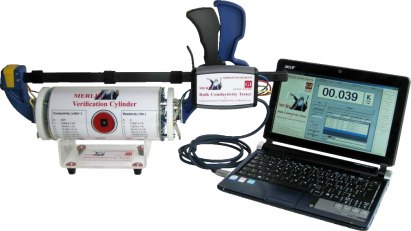 After areas with the lowest potential, highest gradients, and lowest electrical resistance are identified, additional tests are performed to establish the cause of corrosion, e.g., testing for chlorides and carbonation. 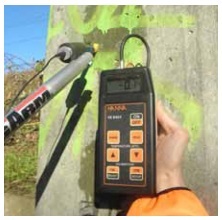 The concrete is removed at several “hot spots,” and the actual degree of corrosion is correlated to the readings. After identification of the cause of corrosion and establishment of the chloride ion profiles and depth of carbonation, the remaining service life may be estimated (e.g., using diffusion theory) or an appropriate repair strategy may be developed. The variation of the potential readings with the Ag/AgCl measuring electrode supplied with the Mini Great Dane is normally within ± 5 mV. The electrical resistance variation is less than ± 5 %. The access slabs of a housing complex had been subjected to de-icing salts for 18 years. No major rust stains or spalling were observed. Shown to the right are the electrical resistance and the potentials measured with the Mini Great Dane on one of the slabs. The relatively low electrical resistance towards the railings indicates a water saturated concrete and/or the presence of chlorides in the concrete. 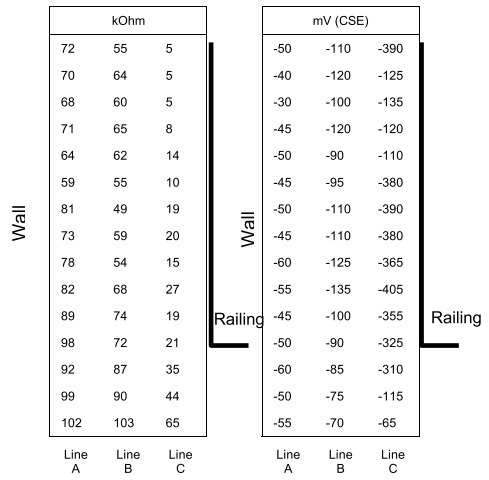 A large potential gradient is noted from the wall towards the railing. When the concrete was removed at several locations towards the railing, the bars were found to have heavy corrosion with a 1 to 20 % reduction of the cross section. Based on further testing with the RCT and the Rainbow Indicator, service life was estimated and a repair strategy was developed.